This powerful multimedia presentation software serves the specific needs of churches worldwide. It's also used in schools and anywhere that media presentation is required. ZionWorx 2014 is high-quality, affordable church presentation software that does its job with no fuss. Feature-rich yet incredibly easy-to-use, it offers hassle-free video playback with integrated video codecs, plus support for motion backgrounds and live video inputs. 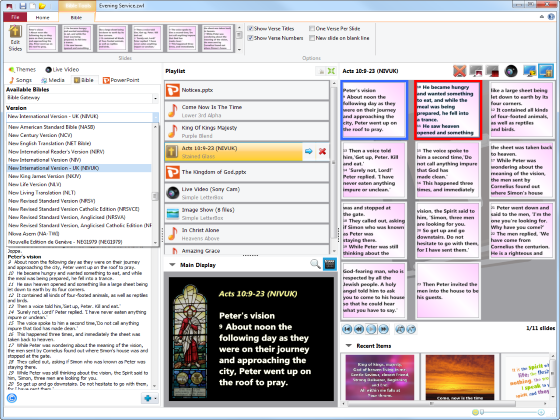 It provides a unique integration with BibleGateway.com for instant access to popular Bible translations, as well as seamless integration with Microsoft PowerPoint. Basic training takes minutes, even for non-technical operators! Comments: ZionWorx is a very powerful and flexible tool that does everything we need from it. Indeed, it provides more than we need - I haven't used all of the features. The song interface is simple to use, and the concept of "arrangements" is particularly useful - for each song you can define (multiple) arrangements, i.e. what order the verses and chorus are in - so if you know that you're only singing verses 1,3 and 5, or that you will be starting with the chorus, you can set this in the order of service. The presentation interface also makes it easy, of course, to skip around within the song (or order) "live", so when the music group suddenly decide to deviate from the plan, you can keep pace easily. There is a PowerPoint plug in as well, and it also works fine with remote controls: so if the preacher wants to control their slides in the sermon, they can. 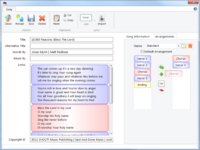 The theme editor is very good and flexible; this lets you define how you songs/Bible verses etc. should appear. e.g. it was trivial for me to add song numbers to the titles of the songs in ZionWorx, and present it clearly but discretely on the screen. The only real drawback I've come across is that ZionWorx does not ship with a comprehensive song database. But adding songs is very easy, and there are various import controls available too. This does mean that, when you first start using ZionWorx, it will take you a little longer to create a service because you have to enter the songs, but once your most commonly-used songs are in the database, you'll be well away. Also, and very helpfully, ZionWorx lets you choose a custom directory for where all its data files are stored. This means that you can install it at home and on the church computer, and have the data files all saved on Dropbox. When you add a song at home, it gets added at church. If you put your PPT files and orders of service on Dropbox too, there is no need to use USB sticks at all. Many thanks for your review! To anyone reading this we just need to clarify that the 'Name-Your-Own-Price' arrangement was only available between 20th February and 15th May 2014. This offered Bronze, Silver, Gold and Platinum purchase options, but unfortunately proved to be a financially unsustainable model. Comments: Excellent software covering all the bases - powerful and flexible, and yet easy and quick to use. Frequently updated, support requests answered quickly, requested improvements and bug fixes introduced frequently. Great value. Reliable - our church use this every week. Highly recommended. Songs can each have their own default theme. No instruction manual - however, online and e-mail support is available, along with some online instructions and Tutorial videos, as well as in-built tips and help within the application. ZionWorx 2014 in the live environment. Comments: I oversee the multi-media system at Birtley Community Church, which has been using ZionWorx V2.x for a number of years. I have taken a keen interest in the development of ZW2014 for the past couple of years, and have followed it from the initial concepts to the application it has now become. Phil Phillimore and I downloaded the released version of ZW2014 onto our respective home laptops and took some time to assess the benefits of upgrading. At times it was difficult to envisage how some of the new features would work in the live environment, but the Youtube training videos were a great help. BCC had an extensive library of several hundred songs / hymns within ZW 2.6, however we decided to start afresh when we actually went live with ZW2014. Starting with a clean sheet enabled us to arrange the songs with verses, choruses, bridges etc. in the correct order without having to copy and paste or hold duplicate data, thanks to the arrangements feature. PowerPoint presentations are used at times, mainly for notices, and these work well. Themes are also used, however we find that it is important to get the text and background combination correct. I have some photos and videos of autumn scenes (as well as some countdown videos), in the media directory, but yellow text, great on dark blue, becomes hard to see over the autumn leaves. We have a guy with visual problems who prefers black text on white background. Quick Slides, in conjunction with the Birthdays theme, is likely to be a favourite. Phil, who normally leads praise and worship, creates a playlist of songs and arrangements for the service on his own laptop. He then exports a play list package, saving it on a memory stick. It is easy to load the play list, with all features, onto the church laptop. Our projectionists have adapted well to the new version. The next step may be to save the play list package to Cloud storage and pick it up from there. Phil's laptop runs ZW2014 on Windows 7 (64 bit) as do the church laptops. My laptop runs Windows 8.1 (64 bit). We have had no compatibility issues to date. Comments: If you are planning to buy worship software, ZionWorx 2014 makes your choice a lot easier and a lot less expensive. ZionWorx costs just £110 for a Church (or team) license for up to 10 users, making ZionWorx, one of the most affordable worship applications on the market. ZionWorx has a clear interface, yet a vast range of features. 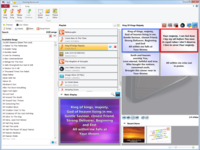 It can import songs from a wide range of applications including: EasyWorship, MediaShout, as well as OpenLyrics and Text formats and PowerPoint. ZionWorx 2 users will be able to transfer their existing databases to the new version. Using its' powerful Song Editor, new songs can be easily added, and stored in the song database and shared between the PC's and ZionWorx can import most video formats without additional codecs. When it comes to Bibles, ZionWorx, can access these direct online from `Bible Gateway,' however you can also import bibles stored on your own PC, using the Zafania format. 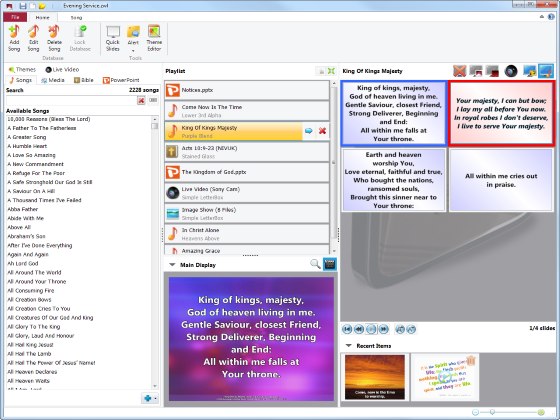 To control the design and layout of songs, ZionWorx uses `Themes,' which control how the design of the songs and bibles are displayed. It comes with a library of these to use, which can be modified using ZionWorx theme editor. Yet ZionWorx's can also `package' the whole service, and within a few minutes of arriving at Church, everything you have previously prepared, will be on screen, just as you planned it. This are no unpleasant surprises with ZionWorx. Talking of which, you will have gathered by now, that I am really impressed by ZionWorx. It is an easy to learn, yet powerful piece of software, yet at an affordable price which will enable more churches to use it. This is all due to the hard work and dedication of the extraordinary team at Jubilate software ' Christian Boxer, Chris Clark and Edd Stonham. It is their hard work, coupled with their passionate vision for the mission of the Church, which is the secret behind this truly powerful piece of software. The whole Church owes them a great deal of gratitude. Comments: I would recommend this software to any church looking to keep their initial and ongoing costs down. Together with a team of four other volunteers, I have been using ZionWorx 2014 song projection software at Ludlow Baptist Church for over six months. Before choosing ZionWorx, I considered SongPro, Easy Worship and ProPresenter. We had a limited budget and already had a projector and a donated laptop and were using PowerPoint to project songs etc. for worship services, but there were severe limitations when using PowerPoint. 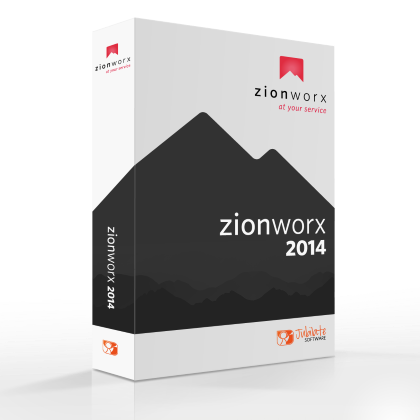 As soon as ZionWorx 2014 was released earlier this year we started using it. It was relatively straightforward to load songbooks and to check our existing library of songs and load any that were already there. Our library now contains 2226 songs from various sources. Support has been prompt and very helpful when needed ' we had a problem restoring a previously saved backup of the database and within one working day after I reported it to Jubliate Software I received a fix. I was also given timely advice on incorporating DVD clips in the playlist. I was pleasantly surprised by the level of support provided. In general I would say that the songs presented via ZionWorx on Sundays have been clear and attractive. It has been relatively easy to compose a presentation screen via the `Themes' feature. It does almost everything we want it to and it's easy to download and put new songs on the ZionWorx database via CCLI Song Select. Pros: We are a small church and needed a simple to use but resourceful presentation software to bring us into the 21st century and this program did it with ease. We checked out several alternatives but were attracted to ZionWorx for its easy use and seamless presentations. We have several computer operators who have all found it easy to use, taking only a short time to get into the swing of it. Setting up the songs is easy, particularly if the worship leader wants to modify the order quickly. All done in seconds. If a visiting speaker wants to put pics or a PowerPoint in it only takes seconds and is done! We have had no real issues with it and found it to be very stable. The price was right too. Cons: When typing in songs and setting them up and undo; button would be good but generally I have no complaints. It does what we wanted and performs beautifully. Heartily recommend this excellent program. Easy to use and reliable with good support too. Pros: We've had this since before 2014. Simple to pick up and use yet it also offers sophisticated options. 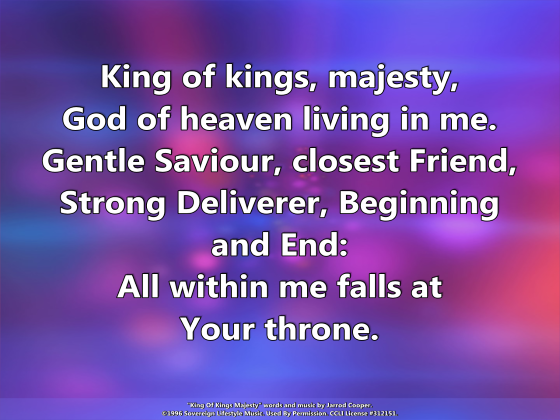 We use it at a basic level with a simple display screen (no pictures or videos) for easy reading for songs and Bible verses and occasionally for a power point or for one of the other more sophisticated options. We don't have a team and when our operator left for Uni others were able to pick it up very quickly. Overall: We got it to go with our first projector so we have benefited from the beginning. Comments: We are a small church of about 100 that couldn't afford a lot 10 years ago as a plant. When we finally went electronic we found Zionworx as a free option. Version 2.6 worked great. Last year we did upgrade to 2014 but had to get a new computer to use it. It works better than ever. We can do presentations of video and pictures so much easier than before because we can use them in the program itself. It is a program interface that isn't totally intuitive to learn but the video help files are great and once we learned the basics of the application it remains a snap to use. Seems to be stable so far. There are some nice bells and whistles that come with it. In particular I didn't realize how handy the arrangement function for songs would be. It is so easy to have more than one way to sing a song handy and usable. The Powerpoint integration has worked flawlessly for us. We just presented a video (drag and drop) and it too worked flawlessly. Themes are a great idea but a little complicated to make. Fortunately the program comes with several that are great and modifying them is relatively easy and fun. Importing files from 2.6 also worked very well and there is a nice way to watch for duplicates and not import them twice. (or not import songs you are intentionally weeding out!) I have had fast response to my one question so far on using the application with dropbox to share the database. The answer was quick and correctly fixed our problems. Although the program is no longer free I do appreciate the hearts of the men who started it and realize that this will still be a service to Christ and his kingdom. Generally this is an excellent piece of software. So much better than SongPro. Pros: Straightforward, easy to set up playlists and change during a service, good set of options without making it complicated. We have a number of people using ZW and they all seem to find it simple to use and intuitive. Linking it to Dropbox has been very successful. Cons: There are still some occasions when the software has failed. This seems to be associated with Powerpoint. It would be good if there was the ability to link directly with websites and I have not been successful in finding a simple way to link in a video feed from a camera. Overall: The software makes presenting services during a Sunday attractive and efficient. It does not tie us down to having just one operator as it is easy to use. Zionworx is worth every penny of the license. We trust it capabilites and seldom experience issues. Pros: Easy to use. 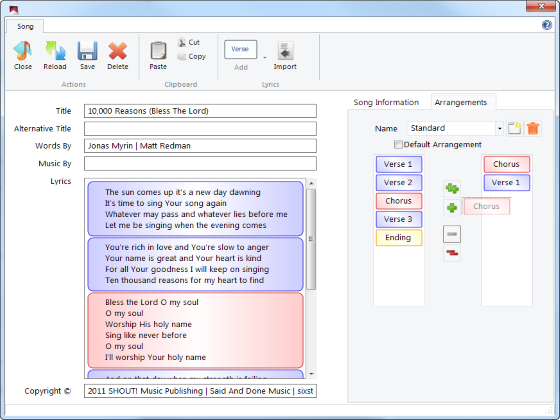 It seamlessly provides all the functionality required in our worship serivce - songs, videos, presentations etc. It used to be that when the service leader wanted to show a video, it was always prefixed with "If the technology works . . .!". We have not heard this in three years since moving to ZionWorx 2014as the technology always works. Cons: Occassionally new releases have minor bugs. Comments: Have been using Zionworx song projection software for a number of years. We started with v.2.5 which had some instabilities particularly if trying to run Powerpoint presentations through the ZW program. This and other limitations were addressed in v.2.6 and we have been using that for the past 3-4 years with no issues. We are currently a small church with limlted technical abilities in our congregation, so we need a system that is simple and straightforward to operate. Zionworx meets our needs. v.2014 was awaited with anticipation, and when the trial version was released in March we started to test. The initial release was unstable operating on my laptop running Windows Vista, but a subsequent software upgrade addressed the main concerns. Now with the latest release v.3.0.8, everything is running smoothly. The import of our old database with over 2000 songs from v2.6 to this latest version could not be simpler - completed in seconds! We particularly like the easy and user-friendly interface with video and images, and whilst we haven't yet used the Bible link very often, it seems to be straightforward. The ability to tailor backgrounds and font themes to songs is great and has attracted several compliments from visitors to our church. Overall: It absolutely does what it says it does, reliably and well. An excellent product does exactly what is says on the tin. Pros: It is the best competitively priced church projection software I have tried. It has all the attributes necessary for a smooth seamless service. The continuous development programme ensures that it keeps pace with changes in technology. Customer service is always swift, together with regular updates and patches. Cons: Nothing major. A few glitches along the road which were been quickly and efficiently dealt with. Not always easy to set up new themes. Comments: Being a long term user of the original ZionWorx app., we were careful to load the new ZW 2014 into our test/bup environment. This enabled us to explore all the new features/aspects without fear of destroying or overwriting various types of media that related to our church and also supplied by ZW. The ZW 2014 YouTube tutorials were an answer to prayer for me personally as I was concerned about the amount of time it would take me to skill myself and then pass that knowledge onto 6 other Projectionists... so a huge thank you to all involved in the development of these tools! We really wanted to get a solution for running DVD's and we were initially a little disappointed when we found there was no built in facility. After an email chat with Christian we now have a robust solution (using an add on app. called AmaRecTV), which allows us to plug our TV, DVD, VHS, Camera(s), via an ABCD switch and an RCA to USB converter. All in all, we (Hampton Park Baptist Church) are very impressed with the new rewrite of ZW and particularly grateful for the rapid and informative response to any query or problem I have had. I thoroughly recommend this tool to any one wanting to seamlessly interface with a projector of some kind, whether it be for church, school or business. Pros: Very easy to learn and for ongoing use. Love being able to change backgrounds on the fly. Integrates well with the PC's file structure. Cons: The inability to re-arrange lyric slides via a drag/drop action on the main presentation screen is unfortunate. To have to always open the song edit screen for simple re-arranging is inefficient when trying to keep up with the worship team's on-the fly changes during rehearsals. Comments: I've used Zionworx for a decade, and the old (free version, 2.6) was quick and easy even on a low-powered laptop. The new version is a radical improvement and a delight to use. What I really like about Zionworx is the ease of setting up a playlist (sequence for a worship service); the simple operator interface for running the playlist; the ability to have moving backgrounds and even live video streaming overlaid with song lyrics; the quality of the fonts (smooth but sharply defined edges and soft shadows); the customizability; the integration of PowerPoint and the ability to create slide shows of images without even using PowerPoint. Oh, and the price, which is significantly lower than other software with comparable features (and I've tried most of the free ones.) Support for the software has been helpful and genuinely interested in ironing out any bugs. We had to upgrade our computer to use the new version - from an older Athlon processor, XP machine to an Intel i5 processor running at least Windows 7, but new machines will probably match or exceed this anyway. And, of course, it was a jump from the free version to paying for the new version. But it was definitely worth it, and the on-screen experience is very professional looking. We find this presentation software great for a small church. Pros: It has all the features we need plus others that are available for special occasions. It is easy to prepare the playlist and easy for the operator to use. This software is affordable for our church. Cons: Occasionally it hangs up and closes down but it is easy to get back on the go again. The developers have been good about upgrading and ironing out the bugs. Overall: Allows us to easily present songs, announcements, scriptures, etc. for our Sunday services. Comments: We began using ZW back in 2007 and it proved extremely reliable and "did the job" however it didnt support the use of video which we were increasingly using at church. Were relieved when we heard that an overhaul was planned which not only would support video but promised many other new features too. We decided to wait for the new version and boy was it worth the wait! ZionWorx 2014 was launched early 2014 and there have been several updates since then fixing small bugs but there has been nothing major and the fixes continue to stabilize the software and add other useful features. We can now show video at the touch of a button, personalize songs with backgrounds, show alerts during a service and much much more. There's more in there than we're using at present including live video feeds which I havent explored yet. Yes, there may be a few small bugs that may still need fixing but this doesn't prevent ZW from delivering a professional, dependable piece of presentation software. We are delighted! If we ever have any problems Christian and his team of "techies" are quick to respond and are extremely helpful. In an nutshell we love it and would have no hesitation in recommending it to others! Pros: Zionwork features add a professional feel to the display. It is also easy to use, it adapts to any presentation and provides the functionality needed with no technical glitches. Cons: New versions of the software have minor bugs. Additionally, it is not a multi-user database. The software cannot be linked directly to websites and it does not provide linkage for a video feed from a camera. Overall: Fast and efficient customer service, easy to operate, the software is reliable, enables data importation and the use of various forms of media. Pros: ZionWorx adapts to any type of presentation, it is multifunctional, the videos are of great help, in the same way the answers for support are immediate, I love that the backgrounds can be customized, that is, each song or verse you can change the background in the same moment without having any inconvenience. With ZionWorx our presentations have a professional style. Overall: It is very useful in our church as it is growing and it allows us to connect the attendees with each presentation and guide them with ease. A great and simple software to use! And you can make it suite your church or specific needs easily. Comments: I really like ZionWorx because it is simple and logical to use. There are many ways to do different things (like for instance when going to the next "slide" in a song you can either click it, navigate to it with your keyboard and hit enter or just hit enter if it's the next one..) so you can choose how you want to do it depending on what feels best for you. Which is really good when people are used to doing things in different ways. The fact that you can, fairly easily, customize the background/theme of your slides is great as well. This means that you can change your theme depending on the meeting or season etc. It gives the meeting that small extra touch. They also have tutorials on their web-site, which is a great help since you can always go there if you need to learn how to do something. And if cannot find it there their customer service/support is really good and fast. They help you until the problem is gone, not just part of the way. I haven't used all the parts of ZionWorx yet, but I am looking forward to it! I whole-heartedly recommend this software! Comments: Pros: Zionworx is really easy to use & feature-rich. 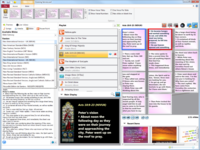 It has excellent support for video (including motion backgrounds and live feeds) and images, as well as integrated Bible (via Bible Gateway integration or local XML Bibles in an open source format). It allows for importing multiple popular song formats. They also have great tech support that respond very quickly to resolve any issues that arise. Cons: Since it is a fairly new product, there are still a few minor bugs to work out. There are a few features that would be nice to have that are on the roadmap for the future but are not implemented yet. Zionworx is an exceptional piece of software that makes planning worship services so much easier. They do a great job to make sure any church can afford the software and provide top-notch service. They are continually striving to update the program to eliminate bugs and provide new functionality to keep making the whole process more efficient and ultimately provide a better time of worship for congregations around the world. Pros: Easy for everyone to use not just the specialists. Really good support when we've had any issues. Changes to other Software (Windows, PowerPoint and some weblinks) has prompted some minor updates but these have all run smoothly. Amazing... and it keeps getting better! Comments: We have used ZionWorx ever since we introduced the projector into the church. It has grown in features dramatically as newer versions have been released and now supports nearly everything a church could want and more. From simply projecting song words onto a screen, to video backgrounds and camera feeds, displaying bible readings, videos, and alerts. We use it ZionWorx all the time from normal church services, kids groups, church fairs, to drama productions. New updates are released regularly and can be easily installed, each update comes with new features. If we ever have any problem we know that we can contact ZionWorx support and they will get back with a solution to the problem straight away. I have tried several other free and purchased packages but i still keep coming back to ZionWorx because it's simple, anyone can use it (it doesn't take much training, play with it and you know how to use it) and the team are always there to help. I would recommend ZionWorx to any church. Comments: Our church is very small (40-60 people/service). We stumbled on the old Zionworx free program when we purchased our first digital projector and were using a Windows XP computer. The program was good, but had a few instability problems and little tech support. We recently were given an old computer with Vista Op Sys, so decided to try the ZW 2014 on it. Every time I reported a problem (there were some) I was immediately replied to and given a solution, or was told the issue would be addressed in the next upgrade. I have received 4 or 5 upgrades to date, and am finding the program a dream to work with, but am the most impressed by the effective and timely tech help service we receive. There are video tutorials available on their web site that are very helpful. ! I would recommend this program to any church! 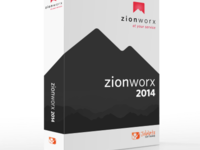 Versatile program; ZionWorx 2014 is easy to use. Comments: Powerful program with many features; works well on my computer using Windows 7. 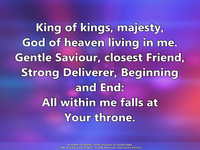 Hymns and songs are easy to enter, by copy and paste or type-in if necessary. As a retired photographer I use many of my pictures as backgrounds or as sermon illustrations. These are easily included at short notice, if needed, even during a service. Change to an Order of Service is easy to achieve with drag-and-drop, and PowerPoint and video clips can be incorporated into the program. There have been occasional issues whilst ZW2014 has been in development, but in the case of any queries the backup service from the ZionWorx team has been second-to-none. I look forward to further tweaks to this program; I'm sure there will be some, though all in all, it is already a very good program. Comments: We've been using ZionWorx since April 2014 and we've found it to be very versatile and easy to use. There are loads of great features, from moving backgrounds, to being able to incorporate videos, PowerPoints, pictures, live camera feed, etc into the service playlists. We've gradually introduced it into all our various services, from the very traditional to the more upbeat ones and have received good feedback from our congregations. I'd definitely recommend this to anyone looking for a good audio/visual solution. Customer service has been outstanding, even when the errors have been ours and the response time has been brilliant, as if they know instinctively when we need an immediate response and when it's less urgent. Pros: Literally, I have had no issues with the software taking any of my media. It works wonders as opposed to some of the others. Everything was simple to set up right out of the gate. I like the one-time payment as well instead of having to pay monthly. Overall: Everyone who has used it has been in awe! Comments: I have been using various presentation programs for many years and we started using ZionWorks from their first release. They now have a very sharp product. I have been impressed with their relationship with me in terms of support. They have understood my requirements and have listened to my suggestions. It suits my presentation of video clips, photos, power point usage, music and song presentation along with record keeping. Very easy for operators to setup and use. In my opinion, best value "presentation program" on the market today. Comments: I first was introduced to Zion Worx about 5 years ago and thought the interface could use some updating. When I needed a new presentation software last year I revisited ZionWorx and loved what they had done with ZionWorx 2014. It is a great product that is easier to use and they have great customer support. I had a minor issue with changing some of the defaults. So I sent them and email and I had a response the next day with a solution and the next update fixed the issue. That is fast considering that I am living and working as a missionary in South East Asia. Comments: We have used ZW 2014 since its initial launch and seen it grow from infancy to a mature product. In its early days bugs were discovered frequently and there were times when we considered moving to one of the more established products. However the friendly, fast and proactive response from the ZW development team gave us confidence that stability would continue to improve and that confidence has not been misplaced. Today ZW 2014 is a stable product which is intuitively easy to use yet contains all the features we require in worship presentation software. Comments: Zionworx is good in what it is made for: Worship presentations. Easy to understand, no steep learning curve. I think it is the best software around at this moment at a fair price that is affordable for smaller congregations. Other keywords: flexible, feature-rich and friendly helping support. Importing my EW-database was easy. It is good to find PPT working again smoothly in presentations. For those looking for a worship presentation programme I say "give it a try", you will not be disappointed. Comments: Our Church used the original ZionWorx for some years without any problems. Due to progress in the Church certain additional requirements were needed and we recently upgraded to the 2014 version. The program is great, flexible, seamless, easy to use and meets all our needs. Although it is a new program that has had some minor bugs they have been speedily resolved and the support has been great. We strongly recommend this program to anyone that wants a professional projection Church program. Comments: We have used Zionworx for a number of years and are very impressed with the latest version and its additional functionality. The user interface is simple and the product delivers exactly what it says for a nominal cost. The ability to have Songs, Video, Bible verses as standard and then incorporate your own video feeds, backgrounds etc sets this product apart from others. The hardworking design and development team are a credit and never fail to deliver support and guidance. Comments: I recently moved to Wavertree where they already used Zionworx and was offered an upgrade to 2014. It is great as it not only allows you to put in songs and powerpoint but now you can add in media - which covers saved internet clips, DVD clips and basically what you can play on your computer. It also allows you to copy the whole playlist of a service to your clipboard and then print it out on Word - without endless copy and pasting - amazing! Comments: I'm in the IT industry and my belief is that a product and support proof comes AFTER the sale of the product. ZionWorx support is far above the rest. Responsive, trusted, and they truly listen to the customer. The product has been wonderful and easy to use with full functionality. What a wonderful product as well as superb support. I'm so thankful for finding and choosing ZionWorx. Comments: The software is top notch, and constantly being upgraded to include new features. For me the best feature is customer support that is second to none; the software writers are easily available and willing to respond quickly to issues concerning how to use the software or potential bugs that appear. Import facilities from other databases work well. Multimedia support works well too. without digging into background folders. Thanks for the great work on this new version. Comments: A great package that a new user can pick up very quickly, especially supported by the video tutorials. Provides a lot of flexibility in terms of adding backgrounds, styles & themes (including live video) to customise to your own "house style". And the support/advice in case of issues or wanting to go something is amazing - they provide the benchmark for all others! Comments: The latest updates have produced a product that that has filled my wish list. I have used the previous verso for many years and it was good with some limitations, but this version dose all I need. I no longer have to switch to separate sound or video, or power point players as it is all within ZionWorx. Wee done and thank you. Pros: The editing facilities are great. Very easy to import data from other packages . Teaching videos are very good and I am starting to get the hang of it. Cons: I do find the pc presentation a bit dated but there is a new major release which will hopefully fix this. I have not used customer support yet so hard to rate, but the teaching videos are very good. Comments: I think ZionWorx is brilliant, it is easy to use as soon as you get familiar with it. You can fine tune it to suit your churches needs. The after sale service is very good and all the people I have had contact with in regards to questions or updates have been very helpful and quick to reply. Comments: I have been using the previous version of 15 years. This new version is all I could have wished for. It is easy to use and covers all requirements at a reasonable price. Anyone using power point slides would find it so much easier. If you try it you will want to buy it! Pros: We bought Zionworx because the previous software would not take all media and it has exceeded our expectations. The customer service is good. Comments: We have been trialing Zionworx for a while now and have found it to be very easy to use and flexible providing a quality presentation for our services. At the price it is excellent value for money. Comments: Pros: price, easy to use, very helpful staff. Cons: A few bugs still. Would recommend to any church looking for Worship presentation software. Comments: I've used Zion worx for over 6 years. It's easy to understand and use & constantly improving. Very professional product and fantastic customer service! Comments: We have been using ZionWorx for several years and love it! It was an affordable way for our small church to step into the electronic world. Comments: I have been using this software for our church over a year and love it! Would recommend to anyone and you won't be disappointed.